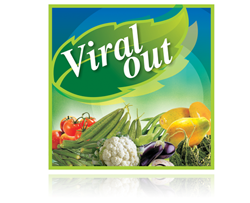 Viral Out is a synergtic organic concoction of bio activates extracted from unique and exotic herbs and medicinal plants and has applications for vegetables fruits cereals pulses.It is a unique Biotechnological based formulation for stopping the spread of plant viruses commonly found in green houses and open farms. The virus infects the leaves which appear fern like, shows mosaic structure, yellowish areas, curling, dwarfing, distortion etc. These attacks are difficult to control with any chemicals as of today. Viruses are nonliving and can replicate themselves in appropriate host cells. They can reproduce inside living cells but are incapable of doing so once exposed to external environment. Viral Out works by ensuring quick absorption of its ingredients by the plants and due to its enzymatic action the virus inside the cell is exposed and gets deactivated. Due to this unique action, the spreading of virus is stopped from one cell to other within the plant so that the tender leaves and sprouts are prevented from infection by the virus. Viral Out's natural enzymes also ensure healthy sprouting of leaves and speedy growth in order to facilitate adequate leaf area for photosynthesis and required energy for the plant to survive this viral attack. Clove extract breaks fungal cell by causing damage to both cell wall and membrane of fungi. Ginger contains an Antifungal protein which is toxic to virus andfatty acids present in ginger penetrate virus cell wall and cause damage to their cell thereby exposing them to outer environment. Spray schedule:	First spray within one week of transplant, second spray after two weeks of first spray and third spray two weeks after second spray and every two weeks thereafter. Spray the solution on leaves to the point of dripping, uniformly immediately on noticing the viral occurrence. Apply second spray after 4 days of first spray and the third and fourth spray after 7 days interval in the same manner. Use of neem based insecticide or chemical insecticide along with Viral Out. This will ensure reduction in insects / pest population thus reducing the virus vectors. In case the plants are severely affected by insect attacks, use a chemical insecticide one day prior to using Viral Out.